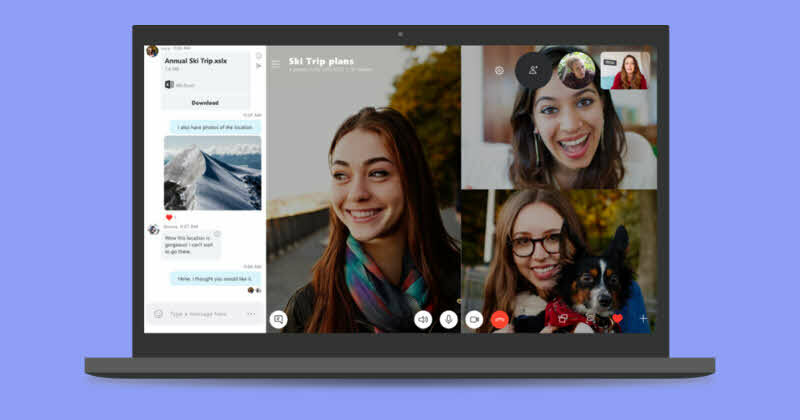 Microsoft has started rolling out an updated version of Skype (version 8) for the desktop that replaces the classic Skype (version 7). They have also announced that the classic version of Skype will stop working after 1st September 2018 and only the Skype 8 will work. So, if you are using Skype and in the old version, upgrade to the latest version of Skype for the desktop to avoid any inconvenience once it reaches the end of support. Skype 8, which is still in its initial stage and yet to address a lot of existing features, was not well accepted by majority of the users globally. That's the reason that Microsoft decided to provide some more time to the existing Classic Skype users. Hence, they decided to extend the support for Skype 7 (classic Skype) for some time. What's new in Skype 8? Free HD video and screen sharing calls - Get together with 1 or 24 of your friends, families, or colleagues no matter what device they use Skype on. See everyone in high definition, view 1080px video, and share things together. More productive messaging - Express how you’re feeling by reacting to messages in conversations. Use @mentions to easily grab someone’s attention in a group chat. Simply type the @ symbol followed by their name to trigger a notification for them. You can easily find all your @mentions and get back to people in the notification center. Chat media gallery - Looking for the link or photo sent a few weeks ago? Chat media gallery makes it easy to find files, links, and photos that were shared in a conversation, whether it was yesterday or last month. No more scrolling through your chat history—just click Gallery under the chat name to see all the files, links, and photos in the conversation. Share photos, videos and other files - Share up to 300 MB at a time over Skype just by dragging and dropping files into your conversation window. How to download and/or upgrade to Skype 8? If you are having the old classic version of Skype, i.e. Skype 7, you can easily upgrade to the latest version of Skype by navigating to Help | Check for Updates. Alternatively, you can download the latest version of Skype from the Microsoft download center. Before installing the latest version, please read the System Requirements of Skype 8. If you have come this far, it means that you liked what you are reading (Microsoft is rolling out an updated version of Skype 8, ending the support of Classic Skype after 1st September).